Tibbits Opera Foundation and Arts Council strives to offer programming which is accessible to the broadest audiences possible. The theatre is dedicated to complying to the American with Disabilities Act and is especially sensitive to patrons with accessibility needs. A barrier-free entrance is located on the south side of the building. This entrance leads patrons to the main floor orchestra section of the theatre. This door to the auditorium will be opened 30 minutes prior to show time. An usher will meet you at this door. Patrons can be dropped off at the ramped curb in front of the entrance. Patrons can request that their will call tickets be held by the ushers so that they can avoid retrieving them at the box office in the front lobby. Whenever possible, patrons should give the box office advance notice so their tickets can be given to the ushers ahead of arrival. The theatre has space set aside to accommodate various types of wheelchairs. 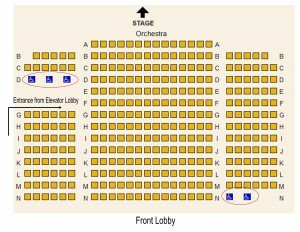 These spaces are indicated in blue on the seating chart below. The spaces are limited and must be requested when tickets are purchased. They may also be selected through the online ticketing system. There are wheelchairs spaces in the location of the pink chair, three rows back from the stage directly inside the barrier free entrance. Additional wheelchair spaces are located in the very back of the orchestra level. Please note that the wheelchair seats in the rear of the orchestra section require moving up a moderate incline in the floor. The balcony of the theatre is NOT accessible by elevator. There are two flights of stairs to the balcony. In certain situations, a patron having a physical disability may request an orchestra level seat for the same price as the discounted upper balcony price. This is up to the discretion of staff. There are no restrooms in the balcony or main level of the theatre. All restrooms are located in the basement level of the theatre. There is one ADA compliant unisex washroom in the basement of the theatre which can be reached by the elevator located in the same lobby where the barrier-free entrance leads. Additional washrooms are located in the basement and require patrons to walk up two steps. Whether you suffer from hearing loss or just want to enhance the sound during the performance, Tibbits offers easy-to-use hearing assistance devices at the box office window for no charge. Keep in mind for theatrical productions, not all performances utilize microphones on the actors. 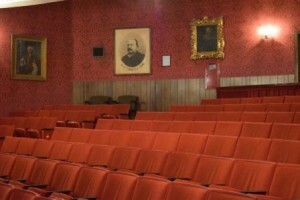 The opera house, built in 1882, reflects a rare vintage theatre with excellent natural acoustics. 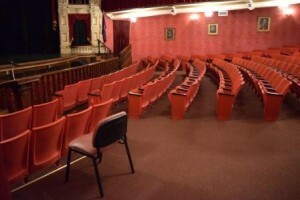 For some performances feature the unique experience and natural acoustics of a 19th-century theatre when the building itself carried the voice of the speaker on stage all the way to the back row of the balcony. 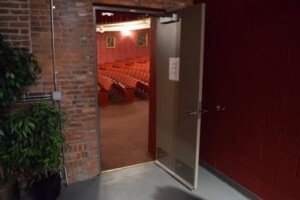 Tibbits Opera House is open to everyone including children and adults who may learn or express themselves in ways that are different than our typical audiences. There are many ways we can accommodate groups and individuals to make their experience at our theatre a great one. Please contact us for more details! I am in awe when I see the beautiful new facade. The Tibbits has always been an amazing theatre for seeing a show, but now the outside reflects the wonderful entertainment that is within.